Hahahahahahahhaahhaha oh my god this movie. I really don’t like snakes but the snake in this movie was so fake and unsnakelike that it never once occurred to me to be the least bit freaked out. The greatest thing about watching this is Jon Voight’s terrible accent. He’s supposed to be from Uruguay or Paraguay or some other South American country, but you would never know it because his accent doesn’t exist in real life, in any country. It was this weird mix of Italian, French, Spanish, and mumble. He also constantly has some variation of this look on his face. Sitting through this movie is entirely worth it, however, once Jon Voight gets eaten by the anaconda, then thrown up by the anaconda, and then vomited Jon Voight winks at Jennifer Lopez. This for real happens. Also, Ice Cube pretty much plays his exact character from Are We There Yet?, which is amazing and makes me think that maybe Ice Cube has a limited range. There’s really a lot to say about this, but I don’t think anything can do Anaconda justice like just sitting through the movie yourself. Imagine that Apocalypse Now and Congo had a movie baby together and that movie baby spit up another movie . . . then you’d get Anaconda. Watching this movie, it reminded me a lot of Congo. I have distinct memories of people loving this when I was a kid but watching it now, it’s crazy nonsense! I mean the movie is mostly about a psychotic Jon Voight. The only reason they ever have to fight multiple anacondas is because Voight attracts them. This whole movie is about a documentary film crew inviting a killer onto their boat, who eventually starts killing them while trying to capture a snake. 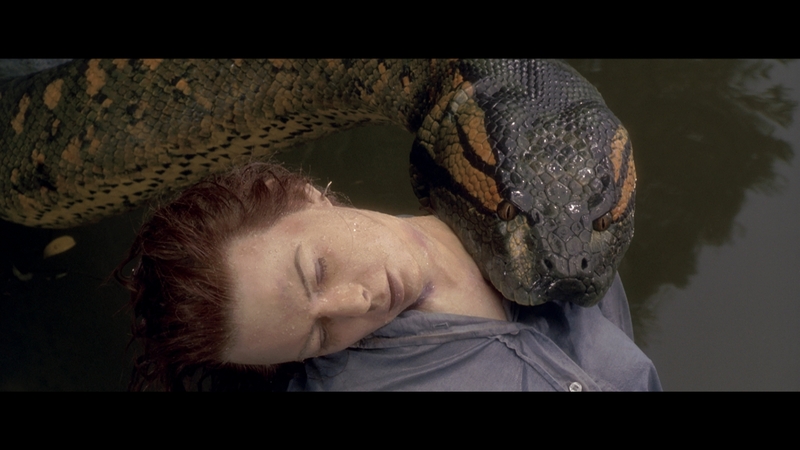 Also the snakes in this movie are not some kind of genetic mutations, they’re just supposed two big, big anacondas.